Marlene Crupi Widen M-D'55 fondly recalls her years at Milwaukee-Downer and was enthusiastic of her decision to commemorate her 50th reunion. She purchased a life insurance policy naming Lawrence University as the beneficiary. This gift will eventually establish the Leonard A. and Marlene Crupi Widen Milwaukee- Downer Scholarship at Lawrence University. It also served to bolster significantly her class gift. "I never imagined being able to make a gift of this magnitude, and had no idea it would be so easy," she said. "We are not wealthy people, but we take great pride in knowing that we're doing our part to perpetuate the Milwaukee-Downer legacy at Lawrence." 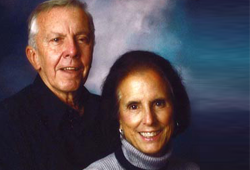 Lawrence owns the policy and Marlene and her husband, Len, make annual charitable gifts to Lawrence in lieu of making premium payments on the insurance policy. This gift is in appreciation for the education Marlene received and the life-long friends she made at Milwaukee-Downer College. Her legacy also ensures the traditions of Downer remain at Lawrence.